After an initial written exam and before a formal one-on-one interview most selection procedures today include a stage of group discussion as an elimination round. Most companies and institutes prefer to have this round to evaluate candidate’s aptitude and ability to perform in teams. During this round soft skills are as critical as technical knowledge. The aim is to know how you behave or react to situations and come up with ideas during discussions. This process today forms a cornerstone is determining a candidate's fit for an organization or college and hence is well integrated into most selection procedures. In general, most of the Group Discussions (GD) would involve a group of candidates brought together in a room to discuss a topic. The topics could come from varied domains and could cover various areas of human life. There would be a panel who would observe the discussion and take notes for scoring the candidates. The role of panel and candidates varies with the rules of the GD. Whatever the form may be, the basic purpose is to evaluate general communication skills, leadership qualities and overall manner of the candidates. In this article, I have tried to highlight specific soft skills and critical points that candidates should consider while preparing for their group discussion rounds. Though the primary focus of this article is for the CAT candidates appearing for their GD rounds, but this is almost equally important for those candidates appearing for recruitment during their campus placements. What I have discussed here is based on my preparations for CAT and job interviews and my experience of conducting group discussion for over 2000 students across dozens of sessions. I have seen a number of cases where the brief for GD preparation from an institute may ask you to be informal or casual. There are many cases where the interview is for a technical position and the aspirant may consider that non-formal dressing is okay. However, I would recommend erring on the side of being formally dressed. Until you are very sure that the dressing policy at the target institution/organization is strictly casual, prefer to stay formal. Appearance does have an impact on the results of GD. It is the first thing that evaluator gets to notice and definitely sends an impression of the seriousness with which you are taking the session. Also, a formal dressing gets you a lot more attention by co-candidates and it is easier to take your message through. I have been in the situation where I was stuck at the wrong place and most of the effort during the GD session went into getting my message heard. I was in a corner seat of a rectangular seating arrangement and had to strive hard even to get into the discussion. All that could help me was a strong knowledge of the topic and a wait until others exhausted themselves on issues tangential to the topic. However, if you have a more central location, it helps to be in relatively more imposing profile. Of course, there are cases where seating is assigned to you by the evaluators based on roll numbers or other criteria but if you have a choice try to gain a central position. If it is a semi-circular setting, aim for the center of the diameter or the perimeter. If there is a circular arrangement, take one of the ends of the diameters. If it is a rectangular seating, aim for the center of the longer arm. The purpose is to be at a position, where others have to pay attention to or have eye pointed at for most of the session. If you enter the GD room in a line, try not to be at the front or back. However, do choose your seat subtly and not make a huge fuss while getting to your seat. You do not want to get noticed, negatively, while in the process of getting the right seat. “What gets you noticed in the eye of the evaluator?” – This is the most relevant question for which you need an answer. In most GDs, you would be part of a group with 10-20 candidates and the evaluators will be scoring you post the session when they cannot see you. So it is critical to stand out of the group during the discussion which would create a memorable impression for the panel. The best way to achieve this is to lead the discussion itself. Be the first person to speak. However, be aware that this comes with a risk of handling the topic naively. Speak first, only if you are confident that you understand the topic well and have a positive contribution to make to the topic. Try to introduce the topic to the group and set the tone of the discussion. 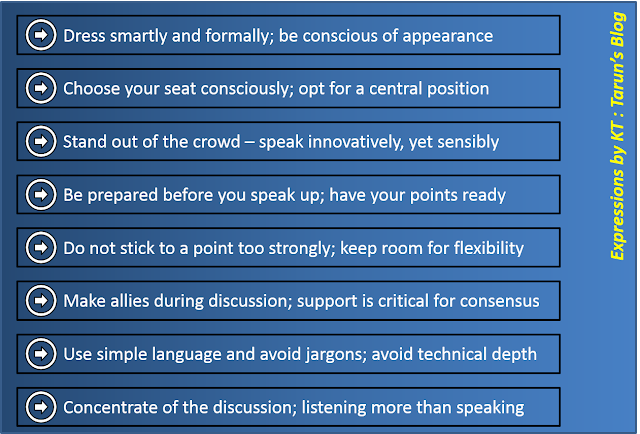 Also, if you can, try to be the concluding speaker. This way you have created a lasting impression in the start and reminded the panel of your presence, just when they are about to take a decision. Another thing that helps your cause is to intervene the discussion with a remarkable idea or a point which changes the direction of the discussion itself. Something, which makes the panel look around to see who brought this wave, is enough to get you noticed. Remember, the panel members have been conducting a similar session, probably with the same topic, throughout the day and have heard most of the arguments. Amidst their boredom, if there is a refreshing perspective, they would more than welcome it. Imagine a situation – you start the discussion or chip in between with a lot of enthusiasm. In all probability, you would have started with a raised voice to be heard. Contrary to your expectation, the entire room stops to listen to what you have to say, especially if it is a difficult topic and no one is sure of what to speak. You speak a couple of sentences and are looking for someone to take the baton. But Alas!! No one is in a hurry to be a martyr and everyone wants you to keep the limelight. However, you only had that one thing to say and never assumed that you would have this smooth of an entry. Who thought that no one would want to score those brownies with the panel? And so you run out of steam and stop waiting for others to speak up. No one does. Who pays? You. All others are part of a crowd at that moment and you were the one with the limelight. So whenever you start speaking, have at least a couple of points ready to elaborate. Also, think briefly about what you would speak and how you could elongate the speech if required. Obviously, you do not have too much time to think but a moment or two spent on this is well deserved. There are cases where you get a topic with which you are too comfortable. It is something you have actually prepared for, discussion with friends or have an emotional attachment to. Chances are you would have a strong view on the topic – one side or the other. This brings you to a very dangerous situation. You start speaking on the topic taking a strong side on one side of the views. However, the entire group takes a very different view and discusses the topic from a very contrary standpoint. You are stuck with your stance as you have firmly shown all your cards and are at a point of no-return. All you efforts to get into the discussion are ignored and your points are never considered as part of the discussion. You are just a mere interference for all others who are in support of each other at some level. So it is better to avoid taking deep sides at the start of the discussion. You may align with one set of views but keep some room for maneuvering in case the discussion does not proceed favorably for you. There would be enough chances to solidify your position towards the later part of the discussion. You don’t necessarily need to change your stance for the group but being a bit flexible only adds to your score. It is a teamwork and discussion at any meeting involves getting as many participants as possible in agreement with you. It is all a game of politics at the end and more the number of friends you have at the table, better are your chances to succeed. In real world scenario, you start the process well before the meetings where you try to steer the audience opinion pre-emptively. Here, you are all meeting for the first time. So, start making friends from the start. Offer a seat to someone, if you think you would not go to a position of disadvantage (as in the first point of the article). Make eye contact with others during speaking and, if possible, communicate to others that you would let them pick up from where you end, all in eyes – no formal MOUs. Also, support points of others and indicate towards them when you use their points. Your support to them would earn you their support later. Avoid interrupting others rudely or demonstrating aggressive stance towards others. Also, try to avoid being a self-acclaimed leader. Steering the conversation is okay as is occasional nudge while the group goes off-topic. But standing in between of discussion to preach the right way to debate is a clear no-no. Don’t try to be the moderator asking specific people for their opinion. Their simple response – “I don’t want to add anything right now” would throw you off your game. Remember it is a general discussion and not a vocabulary or technical contest. You may have technical expertise on the topic and are prepared to discuss all technical nitty-gritty of it. However, not everyone has the same background. They would still want the discussion to be at the level where they can participate. 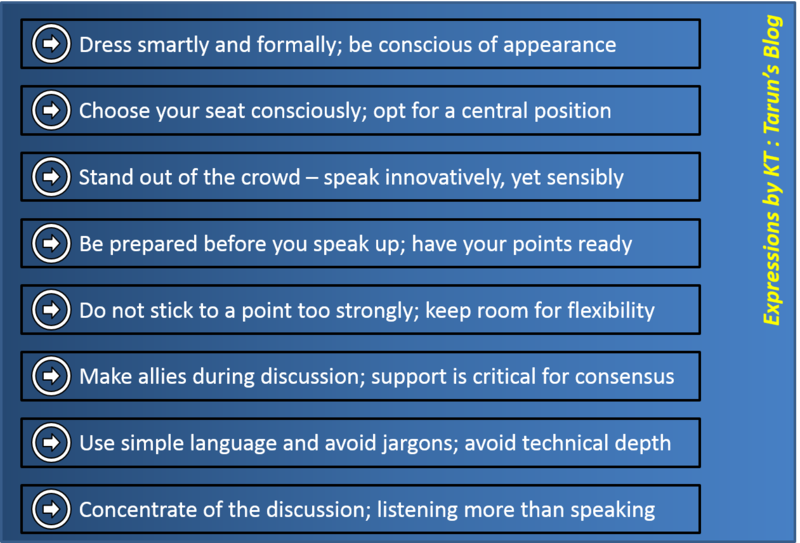 In most likelihood, your technical jargon filled speech would drown in more high level but interesting discussion. It is better to speak in simple English using commonly used words. You could contribute your experience and knowledge but in a language that everyone would be conformable with. If you have to use a jargon, try to give it a simplistic explanation. Also, try to speak slowly and clearly so that you are easy to comprehend. It is important to pay attention to the discussion. It is easy to ignore what is being discussed when you are busy framing your own arguments. Who would monitor if it is your argument which is being covered in discussion right away? So listen carefully to what is being discussed. Use the points being discussed in your arguments which would help build the discussion rather than breaking the flow every time you speak. If you remember, refer to the person who brought the point you are using. Also, keep a mental note of all the discussion as it would be helpful if fortunately, you get a chance to conclude the discussion where you can summarize the entire discussion. These are obviously only a guideline to keep in mind and in no way exhaustive enough to cover all cases. The point is to keep things simple, clear, precise and keep the discussion cordial and participative. It is, after all, a teamwork and how you take everyone along is as important as you perform individually. Hope these give you some base to start with. Drop in your views about the article or comment if you have addition points to recommend.